I’m not a coffee drinker but I sure do love a delicious coffee scent wafting through my home every now and again. There’s just something about the aroma that makes me smile. – – Just so you know, I’ve tried a lot of different blends… some were authentic and drool worthy and others that smelled like a skunk. Don’t laugh… some coffee scents I’ve tried seriously smelled just like a skunk. Don’t ask me why but when it happens, it’s usually the super strong fresh ground versions. That of course has never stopped me from trying more. What can I say? I’m a candle connoisseur and with that is always the desire to find that one of a kind “perfect” scent. When I was deciding on what candles to choose at 1803 Candles, the scent description for Perfect Morning jumped out at me and I knew I wanted to review it. The cream, caramel and pumpkin sold me the most. YUM!!! When I smelled the wax for the first time… SWOON!! I said a few “oh my God’s” and definitely sighed in contentment. This scent smelled amazing. First impression… 100% coffee with lots of cream and hints of pumpkin. Not sure on the caramel but I don’t even care. This is the scent you smell as soon as you walk into your favorite coffee house. The rich flavors of different coffee’s. Are you drooling yet? Okay, time to see how this candle burns! I really wanted to get the fullest enjoyment out of this candle so I decided to try burning it in a small bathroom to start out. If it was too strong, I could always move it but… I didn’t. I left it right there in my powder room where I could enjoy every second of it. It’s a room I walk by constantly so whiffs of scent would tease me with every passing. And that’s exactly what happened. Once the wick was lit, it took a good thirty minutes to reach a full melt pool and from then on out, the warm and rich scent of coffee, cream and pumpkin sugar filled my bathroom. It wasn’t a super strong aroma so this definitely is a lighter scent but boy was it delicious. Just imagine a smooth and rich coffee with lots of sweet cream and bakery pumpkin. Maybe caramel but it was really hard to tell. The overall scent was perfect. Hence…. Perfect Morning. A great name for this scent. Strength – this fragrance was lighter than I expected. On a scale of 1 to 10, I would rate this candle a 3 in a large room. 6 in a medium sized room and an 8 in a small room. So from my experience burning this fragrance, this is definitely a candle you’ll want to burn in a small room to really appreciate the aroma. This candle burned great. Zero issues. Clean burning from beginning to end. 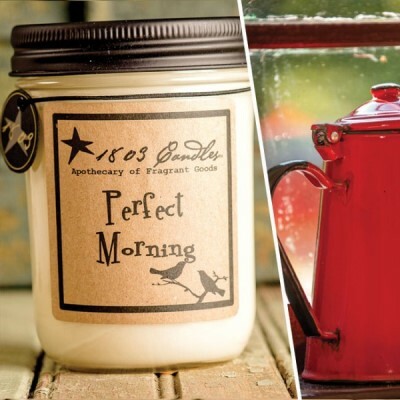 I loved Perfect Morning from 1803 Candles and would totally purchase it again. 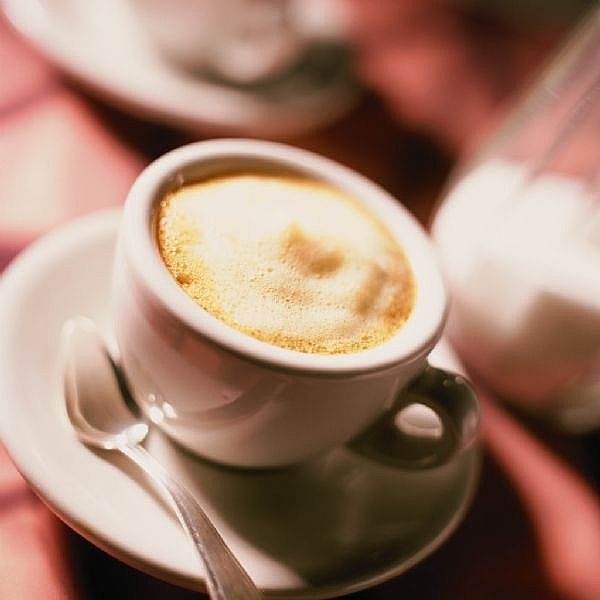 It had all the elements in a coffee scent I love… fresh brewed coffee, heavy and smooth cream with a touch of bakery. It was perfect. My only critique would be the strength – if it could be a tad stronger, I would be in heaven for sure. Coffee lovers… this is a good one and I highly recommend it. Just keep in mind the aroma is on the lighter side so stick to a smaller room when burning it to start out and go from there.